We interviewed Molly Idle, award-winning children's book illustrator and author. Her wordless picture book, Flora and the Flamingo earned a Caldecott Honor in 2014. She also created Flora and the Penguin and has written and illustrated three books featuring Rex, the dinosaur, including Tea Rex, Camp Rex and her most recent, Sea Rex. How has your background in animation informed your work as a picture book creator and illustrator? Oh wow, in so many ways! Seriously, I can’t think of an aspect of my process that hasn’t been influenced by my early work in animation. For starters, working in the studio environment really taught me how to be disciplined. Every day, I had to come in, sit down and work. Some days that was easy and every drawing flowed effortlessly . . . other days . . . not so much. But I had to show up and create either way. That kind of work ethic is invaluable. Then there’s the visual language of film, which carries over into my picturebook work. Character design, color, composition, pacing . . . I approach all of these aspects of picturebook-making with my film making background. The two really have a lot in common as sequential, visual, storytelling mediums. 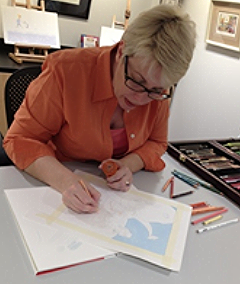 Your work begins with pencil sketching and finishes with Prismacolor pencils. Can you describe your process as you move from concept to finished piece? Are the steps always the same or do they vary depending on the nature of the project? My story creation process varies from project to project. Sometimes an image will spark an idea for a story . . . other times the words come first and spark ideas for images. But when it comes to creating the illustrations for my books, my process is pretty methodical . . . I start with character sketches. Once I’ve created a design I’m happy with I will play with that design creating a model sheet of the character in different poses and facial expressions. That helps me check my work for design consistency throughout the book. Then I start creating thumbnail sketches. Tiny scribbles really. That’s where most of the thinking time goes into my books. The sketches don’t look like anything special, but within these tiny tangles of line, I figure out the composition, pacing and flow of the book. Once I’ve got the pacing figured out I start to work up tighter sketches at 50% scale. Once those sketches are approved, I will scan them, resize them (scaling them up to 100-120%) and print them out. Then I transfer the sketches by hand, using my light table, to pieces of vellum finish Bristol paper. That’s when I break out the Prismacolor pencils and start building up each piece layer upon layer. Though my medium is pencil — I work like a painter— building up an under drawing, and working from back to front. But the upside of working this way with pencil is that you don’t have to wait for anything to dry! You have created two wordless picture books, Flora and the Flamingo and Flora and the Penguin. Were you tempted to add words to the Flora books at any point or were you clear from the start that you wanted these to be wordless? Do you have a preference? I knew from the outset that I wanted Flora to be wordless. The Flora books are about friendship, but they are also about reading body language, so it was very important to me that the characters actions speak for themselves without the aid of text. The storytelling in the Rex books on the other hand, depends entirely upon the interplay between words and pictures, and that too was determined at the outset. Do I have a preference? Yes, yes I do. My preference is for the means of storytelling that best suits that particular story. Do you still have a copy of a favorite book from childhood? Which one is it and what about it made such an impact on you? I have a number of my favorite books from childhood, but the two that stand out most in my mind are The Dr. Seuss Sleep Book, and Little Women. My dad read the Sleep Book to me countless bedtimes, and my mom read Little Women aloud to me when I was six. I think both of those books are wonderful, and I have reread them again and again and again. But just as wonderful to me, as the stories themselves, are the memories I have of my parents sharing them with me. You’ve mentioned how much you enjoy pencil sketching, even as the final art. Is there a strictly pencil black-and-white picture book in your future? I would love to make a black and white book! I have yet to find a story of my own that needs to be told that way, but I’m on the lookout . . .
At a presentation to children, you demonstrated your pencil technique, and one of them asked you about the joys of “coloring” as a full time job! What do you bring away from these experiences? One of the things I love most about sharing my working process with people (big and small) is sharing the idea that creating art is both real fun and real work. I think a lot of kids are taught to consider art to be strictly a hobby-type-thing. Something you might enjoy making when you’re little, but have to give up when you grow up. It’s simply not presented as a job option to most kids (or adults for that matter). But being an artist is every bit as viable a career as being a doctor or a teacher, or a fireman. When I share my work with kids, I hope what they bring away is a sense of possibility. Thanks, Molly, for taking the time to share your creative process with us!